WATERLOO, Ont. -- The thorny issue of compensation at Hydro One reared its head on the Ontario election campaign trail Tuesday, with the Liberal premier calling raises for the company's board of directors unacceptable while her rivals slammed the pay hikes as the consequence of the government's privatization of the utility. Kathleen Wynne said her Liberals had ordered a review into compensation at Hydro One (H.TO) upon learning of raises for executives and board members, including a $70,000 raise for the chair of the board and $25,000 raises for other board members. The results of that review, she said, are expected to lead to some changes. 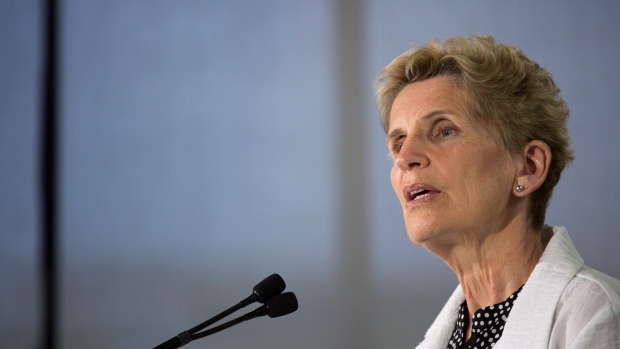 "We've made it very clear that the compensation package that was brought forward was unacceptable," Wynne said at a campaign stop in Waterloo, Ont. "So, that is exactly why the review is happening. We forced that review to happen. We made it clear and the review is happening." Wynne emphasized that the review is examining compensation for all board members, not just executive compensation as had been suggested in April. The pay increases at the company have been in effect since January, according to a document to shareholders issued ahead of an annual meeting Tuesday. As a private-sector, publicly traded corporation, Hydro One's compensation policies are determined by its board of directors. Shareholder votes on compensation -- such as one the government said it was abstaining from on Tuesday -- are considered to be non-binding on the board, although directors often take them into account. Hydro One, the province's largest electricity transmission and distribution provider, was partially privatized in November 2015, with the government saying it planned to use the sale of shares to fund transit and infrastructure projects. By December 2017, the province had sold off 53 per cent of its stake in the company. The partial sale has garnered the Liberals largely negative headlines, with critics linking the sale to high hydro rates and high executive salaries. Wynne, however, defended the move. "We made a decision that the deficit of infrastructure building in this province was critical," she said. "(It) was not going to allow for the economic growth that we needed. So, the change in ownership of Hydro One was part of that and we have been able to move forward with a huge infrastructure build in the province." Progressive Conservative Leader Doug Ford has repeatedly slammed the Liberals over high executive compensation at Hydro One, dubbing CEO Mayo Schmidt the premier's $6-million man, a reference to his salary last year. Ford, whose supporters rallied briefly outside Hydro One's annual general meeting in downtown Toronto on Tuesday, said board members' compensation levels were ridiculous given that their positions were part-time jobs that involved attending meetings. "It's about time people start respecting the taxpayers, respecting the hard-earned money that they've been working constantly for and handing it over to the government," he said. Ford reiterated his promise to fire Hydro One's board of directors and the CEO -- who would receive at least $10.7 million in severance -- and predicted he'll have no trouble finding replacements. "We have more than enough capable people of running hydro," Ford said. "I can assure you that, they're lining up from here to Timbuktu." Ford did not, however, commit to buying back shares of Hydro One, saying it would be premature to make a decision on the matter. "We've got to take a look at the books," he said. NDP Leader Andrea Horwath, however, has promised to restore the company to public ownership if she forms government after the June 7 election. At a rally in London, Ont., Horwath said the pay hikes at the utility underscore the need for her plan. "It's obvious that Hydro One should not be in private hands because the decisions that are being made there are being made in the interests of private shareholders and/or private board members," she said. "It shows that they are completely out of touch with the people of Ontario, that they don't care, they don't have to be in touch with the people of Ontario, because they're not accountable to the people of Ontario." Meanwhile, Schmidt said he recognizes the company has become a "lightning rod" for criticism. "Politics around hydro as a commodity has been very high but really, unfortunately, the focus has come on Hydro One a good bit," Schmidt told analysts on a conference call Tuesday. "We're quite frankly looking forward to getting through the election. We don't have a view or a bias in that election ... but we're not losing our focus as an organization in the meantime." Earlier Tuesday, Hydro One announced it first-quarter profit rose to $222 million, which was up 33 per cent from the same time last year. Hydro One's profit amounted to 37 cents per share, up from 28 cents per share in the first quarter of 2017. Revenue was $1.58 billion, or $875 million after excluding purchased power. That compared with 2017 first-quarter revenue of $1.66 billion, or $769 million net of purchased power.